First off, anyone who claims to be a foodie and then turns up his or her nose at eating the “icky” parts of an animal isn’t a real foodie. You’re more than welcome to not like kidney, sweetbreads or bone marrow, but to reject it out of hand is unacceptable. That’s the same mindset that allows people to skip Indian food because of the “weird spices” and sushi because it’s raw fish. If you want to be a foodie, you’re going to need to grow a pair (balls or ovaries). But what’s even more galling is when people intimate that a dish made with hearts, trotters, brain, liver and more is somehow substandard. Scrapple, which has its origins in Old World Europe, was developed by the Pennsylvania Dutch, a group with as much respect for cooking the right way as anyone (try their pretzels too, and not just Auntie Anne’s). Chances are the pork I’m eating in the scrapple was handled correctly, was more likely to be grown on a farm using sustainable techniques and represents a willingness to not waste even one ounce of usable pig. Can you say the same about that national-brand chicken or bacon you’re eating? Actually, there other segments of the country that have a similar “acquired taste” called liver mush. The only reason I know about it is that when Jim Thome came to the Phillies, his wife said that one of the things he’d miss from home was his favorite liver mush. I thought “WTF”? Someone needs to feed that man some scrapple. Not to start a controversy, but do you prefer your scrapple thin and crispy, or thick, with a mushy inside & a crisp shell? With ketchup or with MAPLE SYRUP????? Yum. Pat…I’ve seen some maps showing the spread of Pennsylvania Dutch influence/settlement and it goes throughout the Midwest, which is where Thome played (Cleveland) and grew up (central Illinois), so I’m not surprised if it’s something similar to what he liked. As for my preferences, assuming it’s a big slice like you get in a diner — about the same size as a 3X5 index card — I like it to be about as thick as a deck of cards. I feel like that gives you enough surface area to get some nice crunch in each bite while providing sufficient meat “filling.” I typically take my scrapple plain with salt and pepper, but I can imagine that maple syrup would be fantastic, too. Gotta try it next time! I do love me some scrapple… But I’m mostly vegetarian now. It would take something quite drastic for me to bend so far as to eat scrapple, but it used to be one of my secret delights! My preferred use is about half as thick as yours, TVFF. I like crunch in my meat. 😛 Then, stack it on an english muffin with an egg, maybe some cheese (and a bit of syrup does make it yummy, yes!). Anything is better encased in carbs! Scrapple n ‘ Pancakes is the North Eastern version of Chicken n’ Waffles. Actually, MonkeyBoy, it was down on the Virginia shore…we went out to a greasy breakfast buffet, and I picked up a bunch of what I thought were French toast sticks, bit right into one, and OOOH I was not expecting that texture. I’ve been a little scared of scrapple ever since. and how old was little BS during this story? There are some diners in the Philly area where scrapple is cooked on the griddle with a weight on top in order to flatten it as much as possible, therefore increasing the surface area of the crispy outside. Basically they are serving a large “scrapple chip”. Others leave the thick slice as-is, and just cook it slowly to get the crispy outside & mushy inside effect. Still others, in an attempt to save cooking time, just use a deep fryer to get that same effect. My PA Dutch father always dredged his scrapple slices in a little four & cooked them in an iron skillet. He claimed that the trick was to put the scrapple in a cold skillet, then cook it at a low temp for a long time. If you travel in and around the Lancaster, PA area (PA Dutch/German epicenter), the scrapple is served with syrup. You cut those pancakes/waffles up, mix in the cut up scrapple (or bacon or sausage), then pour syrup over the whole mess. That’ll stick to yer ribs! 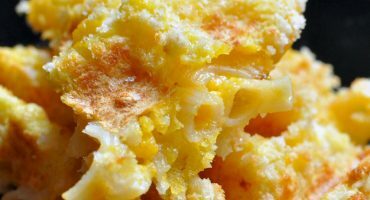 Have to make some soon. I cut them between 1/4″ and 1/2″, lightly flour to help in creating a nice crust. Medium heat in a lightly oiled skillet until both sides are nicely browned. Delicious! 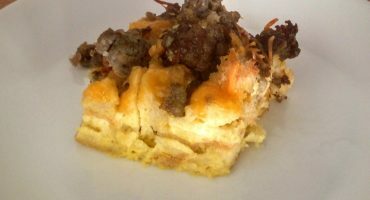 Matches up nicely with eggs of any style but try this next time: scrapple, eggs and grits – yes, GRITS (cheesy grits are best) – a great combination! never heard of Scrapple… sounds like a chick fight. In her 1920 cookbook (Mrs. Wilson’s Cook Book”, by Mrs. Wilson, Mrs. Wilson’s Cooking School, Philadelphia, published by Lippincott, a noted Philadelphia publisher) she includes a recipe titled “Making Scrapple and Hogshead Cheese”. She starts off her recipe by saying “When the family is small, thrifty women usually make the scrapple and hogshead cheese at the same time. Have the butcher select for you a nice hogshead; split and then remove the eyes, brains and tongue.” After the prepared hogs head has been boiled in enough water to cover the head, and the meat is cooked, she then says “Now remove the bones from the head and chop sufficient meat very fine to measure three cups, and set aside for making the scrapple.” She uses two cups of the boiled stock and the remainder of the cooked head meat to make the head cheese. Then her follow-on recipe for making scrapple is titled “The Scrapple”, is to put the boiled head meat back into the head stock and add to each quart of the head stock two-thirds cup of corn meal and one-third cup of buckwheat, plus salt and seasonings (unspecified). Nowhere in her recipe does she include pork snouts, liver, or kidneys, the ingredients in commercial scrapples which give the product its “ew-w-w! food” label and it’s reputation for being made of “offal”. Because Philadelphia was the primary point of departure for all the German and Swiss German Amish and Mennonite immigrants, I believe Mrs. Wilson’s recipe for scrapple is pretty much the definitive Pennsylvania German/Swiss German/Amish/Mennonitet type of scrapple, i.e., a scrapple which may contain pork liver, kidney, tongue and snout, but which uses only cornmeal and buckwheat. Personally, I’ve found that scrapples which use wheat flour instead of buckwheat (scrapples made in Delaware, for example) are significantly ‘mushier’ when both type of scrapples are cut to the same thickness. I have a close family friend who grew up on a farm in Maryland, south of Baltimore, where the family patriarch (originally from a part of Germany east of the Rhine) annually butchered hogs on their farm and made headcheese and scrapple exactly the way as described in Mrs. Wilson’s cookbook. For another thing, contrary the Pennsylvania German scrapples shouldn’t at all be considered just a regional type of “breakfast food”, like ham and eggs or bacon and eggs. You can make a quick, very good, and surprisingly low calorie (compared to an equal weight of hamburger) scrapple “cheeseburger” with two pieces of toast (or a bun or a roll), some hamburger pickles, lettuce, thinly sliced onion, and a thin slice of tomato. Cut the scrapple to 3/8″, (apporximately two ounces) and cook it 4-5 minutes a side in a teflon-coated frying pan (don’t use any shortening, oil, or butter). A slice of American cheese ‘tailored’ to the shape of your scrapple, put on top to melt half-way through the cooking time for the second side, makes an quick and tasty lunchtime treat. Then too, thinly sliced but larger pieces of cooked scrapple can be the meat course for dinner, along mashed potatoes or sweetpotatoes, and green vegetables such as peas, lima beans, or spinach. 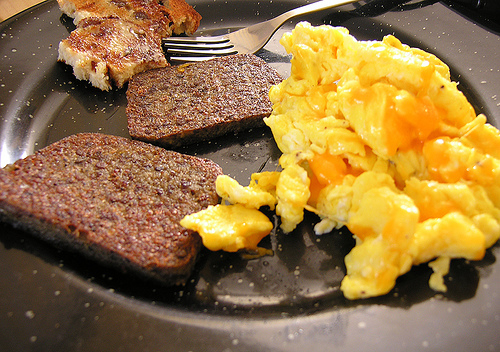 A scrapple can be made of any type of meat — beef, pork, lamb, chicken, fish, or shellfish. Scrapples are generically a cereal grain mush in which meat (or vegetables) have been mixed into during the cooking. One example is the recipe for German “panhas” (which has a number of phonetic spellings) which specifies good beef cuts combined with buckwheat flour and allspice seasoning (good cuts of pork are also allowed as an acceptable alternative), and cooked for an hour or more, or until a stiff mush is obtained. I’d like to point out two major points of confusion for a great many people about the term ‘scrapple’ and the use of the phrase “Pennsylvania Dutch”. Firstly, the term “Pennsylvania Dutch” originated during colonial times as an ethnic and religious slur. The English settlers certainly knew full well the difference between the early Dutch settlers and the later German immigrants. The English disliked the Dutch, and to call someone a “Dutchman” was a common perjorative of the time. You can Google the terms “Dutch uncle”, “Dutch courage”, and “Dutch leave” to see how the term was (and still is in some geographic locations of our country and Canada) an ethnic slur. Consequently, the term “Pennsylvania German” is increasingly preferred over use of the term “Pennsylvania Dutch”. Secondly, I don’t believe the term “scrapple” refers to “scrap” pork, pig or hog meat. I believe the term derives from the Dutch word “schrappen”, meaning to cut or scrape. In the Dutch language an “sch…” is pronounced as “sk…”, e.g., school, schooner, etc., and in butchering a pig a sharp knife is used to cut/scrape meat from bones in the de-boning operation. The “scrapings” from de-boning are tossed in a tub to be rendered for their fat (lard) content, and are not “scraps”, which generally has a negative conotation in contemporary English. i’m from philly and never thought twice about scrapple until i brought friends or boyfriends home to meet the family and my mom served it for breakfast and they’d always look frightened. that’s when i realized not everyone had the pleasure to be raised on it. i love it. love it. used to be made fun of in our parts as “lips and assholes” but that still didn’t stop me from eating it. “You can only get the stuff in a relatively small portion of the country”?